Slabmaster’s owner got his start in the industry working for a company for over 20 years before he started his own business. The entire staff is hardworking, honest, and extremely dependable, providing straightforward quotes and details of the installation or repair process. We place a strong focus on maintaining a positive attitude, working as a team, and meticulous attention to detail. Since our business began back in 2000, we have increased our sets of equipment from 3 to 5, allowing us to serve more customers faster. 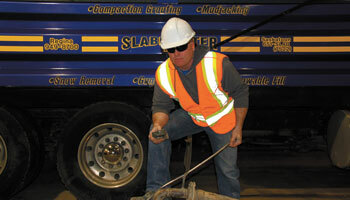 We specialize in mud jacking and compaction grouting, two of our most popular services. We also do Flowable Fill and Shotcrete as well. We believe our customers are our best form of advertising; we’ve received many new customers through repeat customer’s referrals. The tenure of our staff, along with continued improvement of our equipment and material is what drives our success. Contact us to begin working with a construction company that is committed to the success of your project.